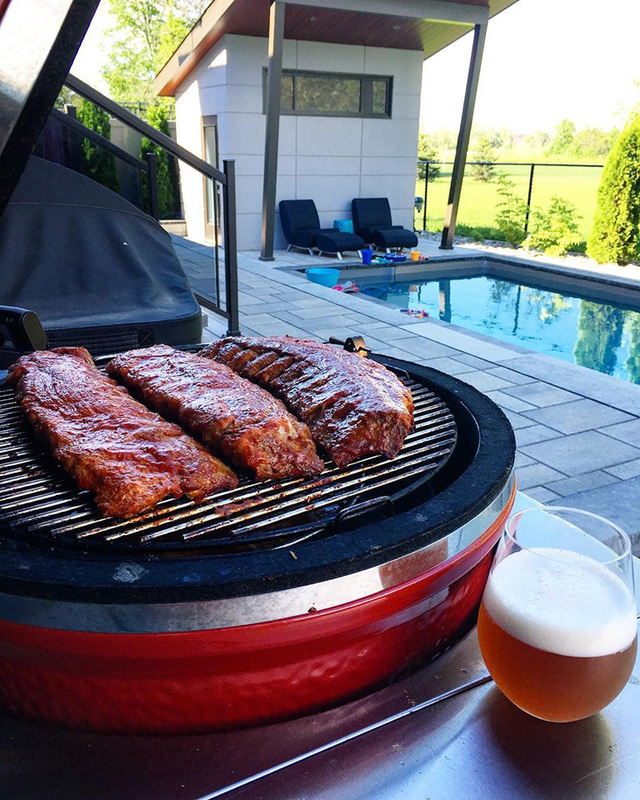 "Just wanted to share with you my recent happiness with using your recipes from the website. I have been AG brewing for 4years and in the past month made both the Electric Pale Ale and the Electric IPA with outstanding results. Very balanced beers and easily the best I’ve made. I followed the recipes through including the water profiles and can’t believe how good they turned out. Last night I tried the EIPA after it had been carbonating for a couple of days, WOW!" - Dan P.
Looking for a lower alcohol version of this beer? 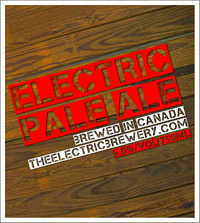 See our Electric Pale Ale "sessionable" version. This is an all late-addition American Pale Ale (APA) where hops are only added in the last 20 minutes to give it very smooth bitterness with a massive hop flavour. (More information on late hopping on Jamil's site here). 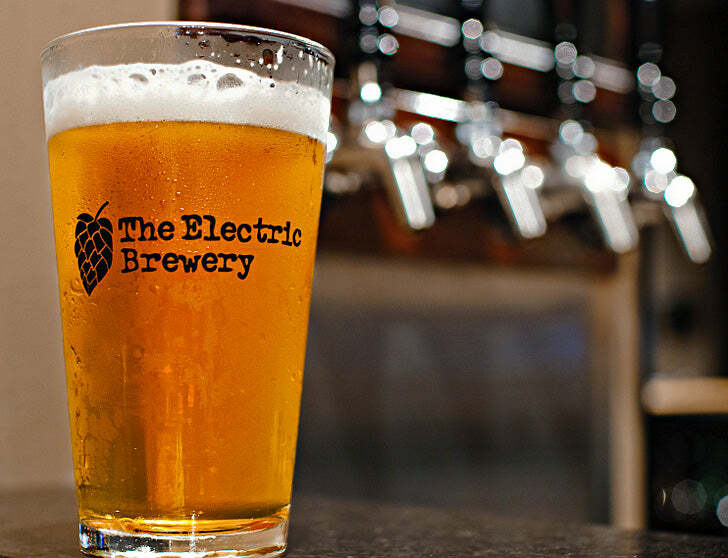 The Electric Pale Ale is one that I've made a few times now and everyone who tries it raves about it. I've made minor changes to the hop bill over the last year or two until until I got it exactly the way I liked it. It's one of my house beers that I like to always have on tap as it's dry and thirst quenching (my preference for APAs). A large portion of the hop goodness comes from the Citra dry hops - they're essential (IMHO). I've also tried this recipe with 100% Citra hops but it just wasn't the same (it was somewhat one dimensional). I prefer this version here. Try both and let us know what you think! Boil for 60 minutes. Lid on at flameout with 0 minute hops, start chilling immediately. Nice recipe, Kal! I really like the brews I have made that incorporate only late hop additions. Even better when there's Citra involved, too. I'm gonna do this brew on the 4th, I will left you guys know how it turns out. IS there a Wyeast yeast that is equal to the US-05? If there is not, how much of a starter did you make for a 5 gallon batch. I actually scaled this for a 10 gallon back. Also, did you keep it in the primary for 2 weeks and then transfer to secondary for 10 days? Keg after that? How long did you left it age after it came out of the secondary? Basically WLP-001, 1056 and Safale US-05 are extremely similar, if notthe same strain of yeast. So you should be able to substitute the White Labs (WLP-001) or Wyeast (1056) equivalent for the Safale US-05. I'm still learning here - the lack of early hops is why the IBUs are so low for all that's added, right? So this beer shouldn't actually be bitter, but instead have a ton of citrus / pine in both aroma (dry hop) and mid-palate (late addition)? Never seen a recipe like this before, so pardon if my questions are dumb. Kinda wondering the same thing, there is a crap load of hops going into this. I just ordered all the hops, Amarillo was hard to find and expensive..
Whats your opinion on using Citra Pellet hops instead of whole hops to dry hop it? Another question, it says to add the last hops and then put the lid on. On how long to you steep the hops before you remove the lid and chill it? Take a look at the end of the recipe for Wyeast/White Labs liquid yeast suggestions. I've added these now. I ferment until it's almost done and then add the dry hops in the primary. At 66-68F fermentation temp this means adding the dry hops after about 7 days then leaving for another 7 days, then racking to the brite tanks and adding gelatine and letting it clear for 2-3 days, then kegging. I've added extra information to the original recipe. I'm still learning here - the lack of early hops is why the IBUs are so low for all that's added, right? So this beer shouldn't actually be bitter, but instead have a ton of citrus / pine in both aroma (dry hop) and mid-palate (late addition)? Correct again - that's the idea! See the link in the recipe description from Jamil's site that explains the ins and outs of late hoping. I pretty much use pellet hops exclusively because they keep better and store better. I only rarely use whole hops, usually when a local farmer gives me some to try out only. I usually start chilling immediately and leave the lid on. I've updated the instructions to include this. I usually start chilling immediately and leave the lid on. Thanks, whats your opinion on using pellet hops for dry hoping? I pretty much use pellet hops for everything since they stay fresh longer, there are more varieties available, and they pack smaller. I ferment in a primary until fermentation is done then use a secondary only as a bright tank for 2-3 days (I add gelatine) and then keg. If there's dry hopping (like this beer) I dry hop in the primary once most of the fermentation is done. I then leave it in the primary for 7-10 after after adding the hops (fermentation will most definitely be done then). Once in keg I put it in the serving fridge/freezer and attach the gas. Takes a couple of weeks or so to gas up properly which also allows it to mellow a bit. Just so I understand the schedule. I may change something but let me know if thats okay. -Transfer to keg, put in fridge. How long to you let it age or condition before you carb or until it's drinkable to your standards. This schedule is for the above recipe. I've never dry hopped before, I will be using carboys so do you add the hops to a hop bag and just drop them in the carboy? If you do that, do you have to sanitize the hop bag or do anything to the hops? That's pretty much what I do for this beer (or similar ales that are dry-hopped). Once it's in the keg I put it in the serving freezer and attach the gas line right away (no waiting). It then takes about 2 weeks to carb up and is ready to drink then. The 2 weeks also helps to drop out any chill haze that may have formed and also mellows the beer a bit. I always have other stuff to drink first so it's often more than a month before I tap it after having placed it in the freezer. I just drop them in. You don't need to sanitize or do anything to the hops. Generally speaking, nothing grows on pellet hops. If you get any sort of infection from dry hopping with pellet hops you'll be one of the first (unlucky) people in the world that this happened to. I often measure out my dry hop pellets in cups or other containers that were never sanitized or even cleaned for that matter (full of hop debris). Once the beer has alcohol in it it's also harder for infections to take hold. Knock on wood but I've never had any sort of infection. Generally speaking you cannot infect a beer from adding hops. So I brewed this beer yesterday and it went very well. I was having a problem with my temps but that was it. I bought a thermapen and my thermapen was reading 149-151 throughout the mash but my blichmann dial thermometer and PID both were reading exactly 152 the whole time. I don't know if my thermapen is off or what. Anyway, I have a new question. I pitched the yeast and this morning i checked on it to find out the krausen has filled up my carboys and into the airlock. It's actually flowing out of it as well. Is this a problem? What should I do? Oh yeah, I ended up with 91% eff. on my RIMS system. Just wanted to say that I have been checking on this beer everyday and then a few days ago i added the dry hop addition and this beer smells absolutely wonderful. i can't wait to try it. Took a little sample the other day and it's still very bitter, needs to mellow out ut behind all that bitterness there is lots of flavor and boy does it smell good! Well i transferred to a keg last night. Being that's its not carbed yet I can't give my final verdict but this beer tastes great!! It smells absolutely wonderful. From the way it smells you think it would be a strong IPA but it's not. Right now it's got medium bitterness. So far so good. I recommend this recipe to anyone. Glad you like it! It's definitely one of my favourites! Well there was a bjcp beer contest this weekend and i had 2 others going into it. Even though this beer needs to age i said what the heck and entered it. I took 1st place for a cream ale and 3rd place for this APA. I was just a few points off because the bottle was not properly carbed. Just thought id let you know. Anyone have this in BeerSmith format (*.bsm file)? Sounds like a Winner!